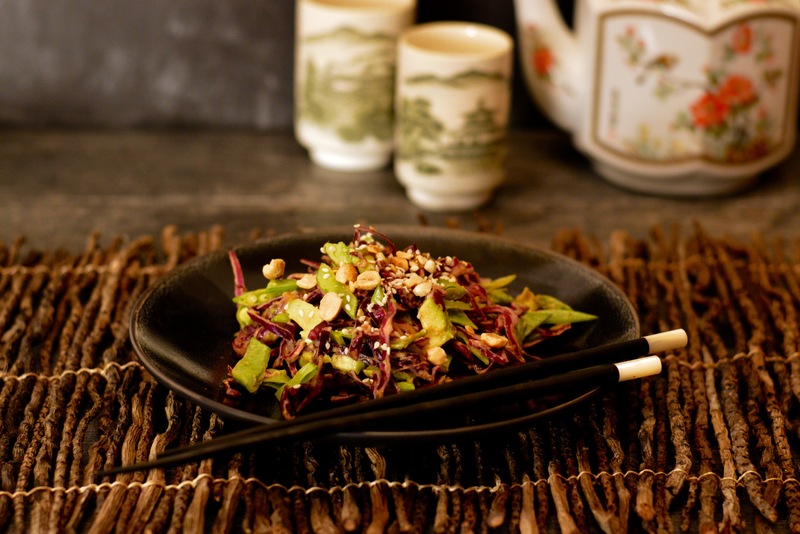 This Asian inspired salad is a crunchy mouth party! The Rock Star LOVES Thai food. We were having some friends over and I decided to do some Thai flavors. One of the side dishes was this salad. Crunchy red cabbage and chopped snow peas are the star of the show but they get set off just right by the sweet and tangy flavors of the peanut sauce inspired dressing. Today’s salad is meatless yet satisfying and could be eaten as a meal or as aside dish. I hope you enjoy it as much as we did! Toss all salad ingredients, except 1/2 the peanuts and sesame seeds in a large bowl and set aside. Mix dressing ingredients together and toss with salad until completely incorporated. Sprinkle remaining peanuts and sesame seeds over the top and serve immediately.